The RESONANCE network’s final showcase took place in 2014’s European capital of culture, Riga (Latvia). Organized and curated by Viestarts Gailītis and Skaņu Mežs, his ‘association for adventurous music and related arts’, all works commissioned by the network in its second two year period could be experienced as the first part of the Sound Art Exhibition SKAN II, between May 30th and June 20th of this year. 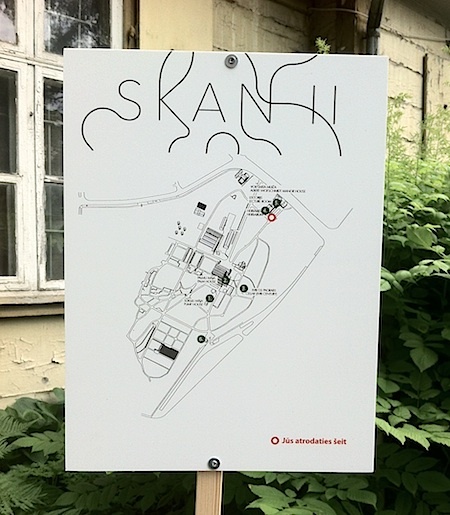 All artists were assigned their own special spot in Riga’s Botanical Garden, where they re-installed the work they had created for RESONANCE. 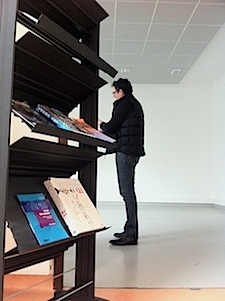 Except for Pascal Broccolichi, who re-created his Table d’harmonie in the nearby Kalnciema iela Gallery. 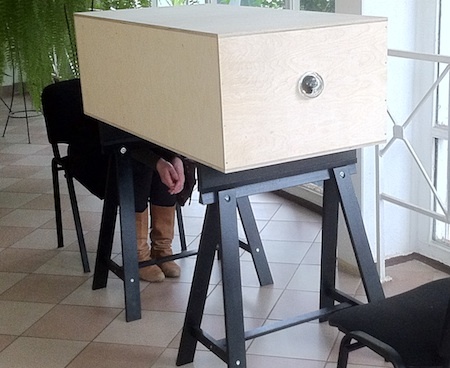 Also in Riga Pascal composed the corresponding sound piece with recordings that he made locally, with a hydrophonic sensor. This time they revealed the sonic patterns caused by the streaming waters in different parts of the Daugava river and the Gulf of Riga. 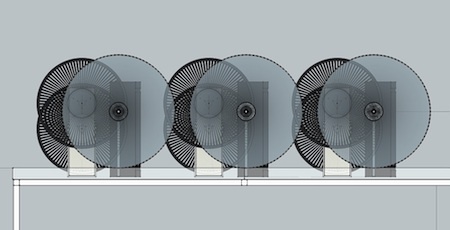 Jitske Blom and Thomas Rutgers profited from the modular construction of their Beaters. 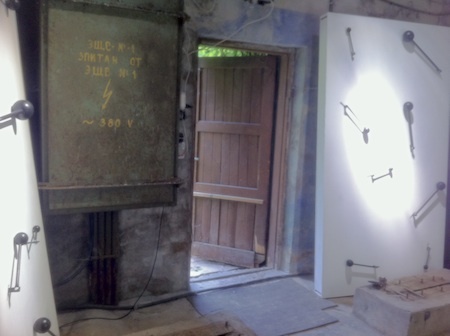 They separated the installation into a number of smaller Beater panels, that then occupied an old shed (the Pump House) in the Botanical Gardens. 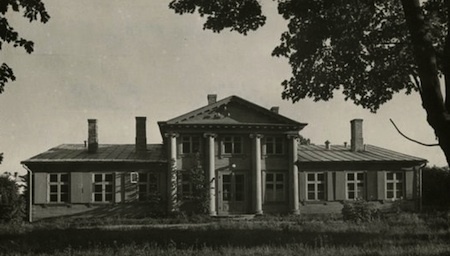 Peter Bogers’s Untamed Choir and Stefan Roigk’s Bursting Confidence each took up a wing of the Wolfschmidt Estate: a wooden manor-house that – or so we were told – used to be the summer house of Albert Wolfschmidt (Volfsmits in Latvian), once the royal Dutch consul in Riga, and owner of the land on which now the Botanical Gardens stand. As the pictures suggest, the unusual spaces and surrounding in many cases managed to open up some hitherto hidden dimension of the works. This was definitely the case for the 18th century dome-shaped former wine cellar in which Aernoudt Jacobs set up his Photophon, not in the least because of the domic space’s typical acoustics. 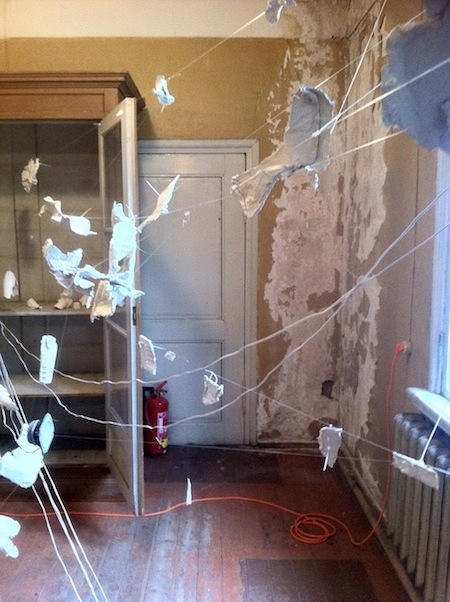 As a work to which the notion and concept of material memory is central, Signe here turned her Writings installation into an archive of itself, which thus in Riga came full circle; like the RESONANCE project as a whole. 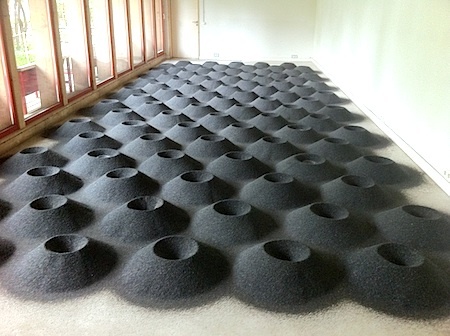 Exploring the almost-impossibilities between art and science. It was while working on this receiving end of his photophone that Bell discovered the optoacoustic or photoacoustic effect. He found that solid materials that were exposed to a beam of sunlight that was interrupted by a fast turning wheel with slots (thus giving rise to a very rapid series of light pulses), started to produce sounds. The main (though not sole) reason for this is photothermal. The physical explanation goes roughly like this: the material is heated by the light energy that it absorbs, which causes it to contract and expand; these ‘movements’ of the material then give rise to pressure changes in the surrounding air; but that of course means that there will be sound! 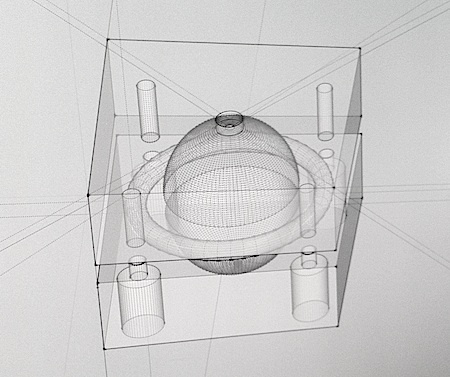 Aernoudt’s work is a fine example of a combination of artistic and scientific research. 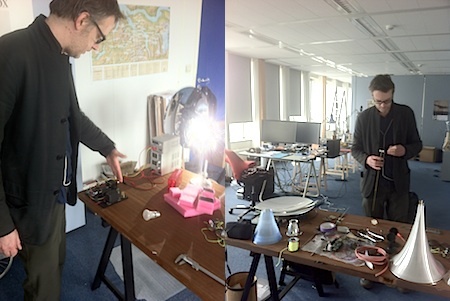 He has been developing his Photophon installation in close collaboration with the Laboratory of Acoustics and Thermal Physics of the Catholic University of Leuven in Belgium. I saw a prototype (picture above) of the elegant and intriguing horn-like object that is to become the sounding heart of the installation, when earlier this year, at the IMAL in Brussels, I visited an exhibition of Overtoon, the Brussels based platform for research, production and distribution of sound and media art that is directed by Aernoudt and Christoph de Boeck. 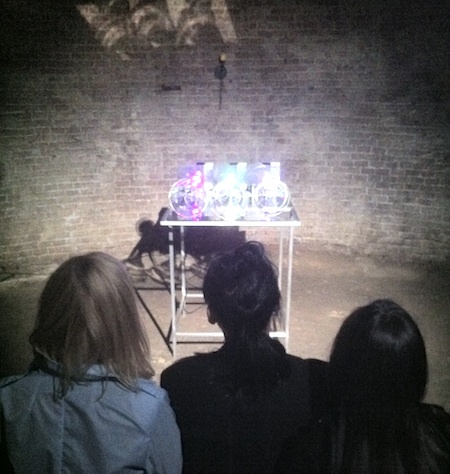 At the IMAL I saw light, I saw movement, but I did not hear any sounds. And you will use glass horns. Glass surely has acoustic properties that are quite different from those of the plastic you used for the earlier versions. This will also influence the sound, I presume. How did your collaboration with the Laboratory of Acoustics and Thermal Physics at the KUL, the Catholic University in Leuven, come about? Which then will allow you to jump right in. Do you have a scientific background yourself? Or is your scientific knowledge self-taught? 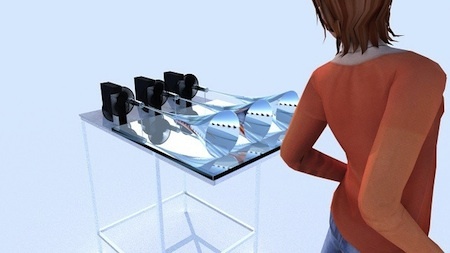 What is the role of space in the Photophon installation? I guess it would be possible to add some sort of a controller to the electric motors that drive the wheels, to change the speed of their rotation in real time, and thus vary the resulting sound in real time. You might then play the Photophon like a musical instrument. 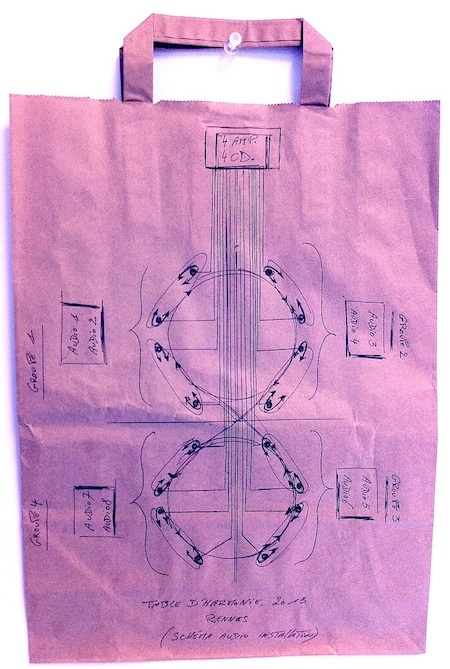 So the sounding result will be like a microtonal chord? Aernoudt Jacobs’s Photophon can be experienced at Intro in situ (Capucijnengang 12, Maastricht, the Netherlands), as part of a RESONANCE showcase including works by Peter Bogers, Signe Lidén, David Helbich and Thomas Ruthers & Jitske Blom. 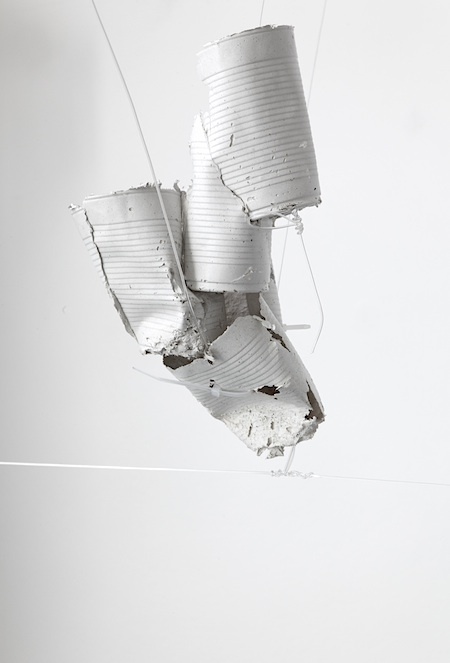 The opening will take place on Friday September 13th, 2013, at 17h00. The RESONANCE exhibition at Intro in situ can be visited daily from Saturday September 14th until Sunday September 29th, between 11h and 17h. 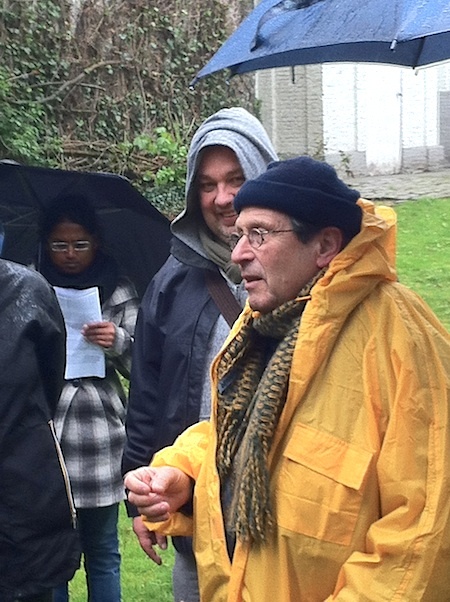 There will two special guided tours by Harold Schellinx (on Thursday September 26th and Friday September 27th, at 19h30), and a lecture on sound art by Armeno Alberts, on Thursday September 26th, at 21h30. 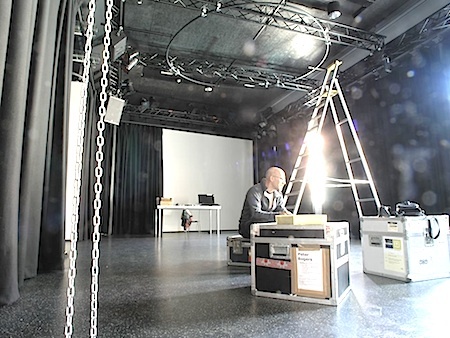 “Phonophon” was produced for RESONANCE by Stichting Intro in situ in Maastricht, the Netherlands, with additional support from the Dutch Province of Limburg. 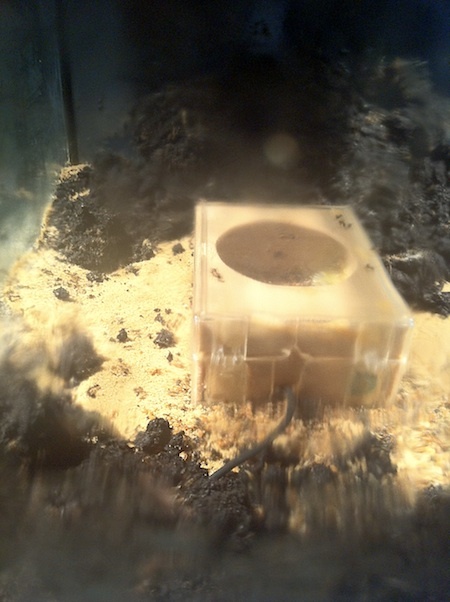 The work was developed by Aernoudt Jacobs in collaboration with the Laboratorium voor Akoestiek en Thermische Fysica (Laboratory of Acoustics and Thermal Physics) of the Katholieke Universiteit Leuven (Catholic University of Leuven). The past couple of weeks in Østre (the Lydgalleriet’s new space for sound art and electronic music in Bergen, Norway), Dutch artist Peter Bogers has been working on the installation and fine tuning of Untamed Choir, a new work that he produced for RESONANCE, and which will premiere as part of a short summer-exposition at Østre (from July 25th until August 11th, 2013), also featuring The Beaters, by Jitske Blom and Thomas Rutgers. 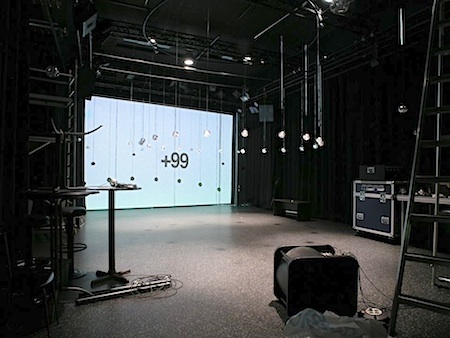 Peter Bogers’s new work is a spatial composition that uses 30 vocal tracks, played back through a set of 40 small loudspeakers that are hanging from the ceiling of the room into which the piece is projected. 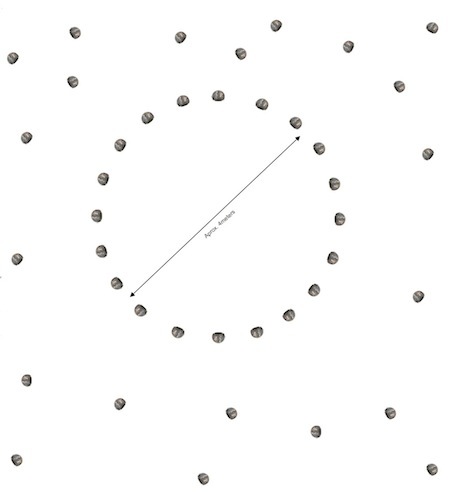 20 of these are positioned on a large circle, with their cones pointing inwards. The others are spread over the rest of the projection space. The following picture shows a sketch of a possible positioning of the loudspeakers, but the precise distribution of the speakers will obviously depend on the properties and dimensions of the room in which Untamed Choir is presented. How did you go about collecting the vocal material that you needed for the work? And with the extensive spatial configuration, the listener, when moving around, will experience a continuously changing perspective? 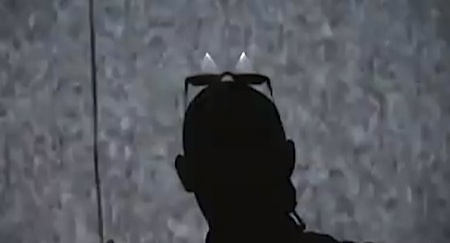 Along with the noisy images that illuminate the space, also a running time code is projected. What do the numbers refer to? “So there is a beginning. Then there is an end. And in between it is a cycle. It also shows a very early fascination for the human voice. Your background is quite obviously in the visual arts, but do you consider yourself to be, nevertheless, in some sense, a composer? 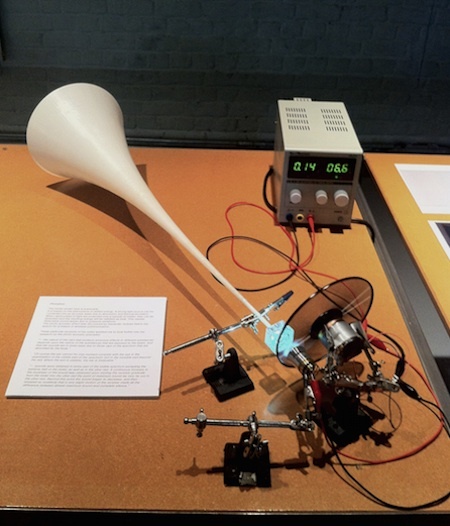 There is quite a long tradition within music and sound art of works that quite specifically address the distribution of sound sources and musicians within a space. Is this something that you have looked into? “The title ‘Heaven’ is that of a Talking Heads song. Heaven is a place where nothing ever happens. That’s a wonderful image. When this kiss is over it will start again. It will not be any different, it will be exactly the same. Heaven is a place where events do not devalue. Here on earth, for us, that is not the case. And maybe that is indeed our problem. 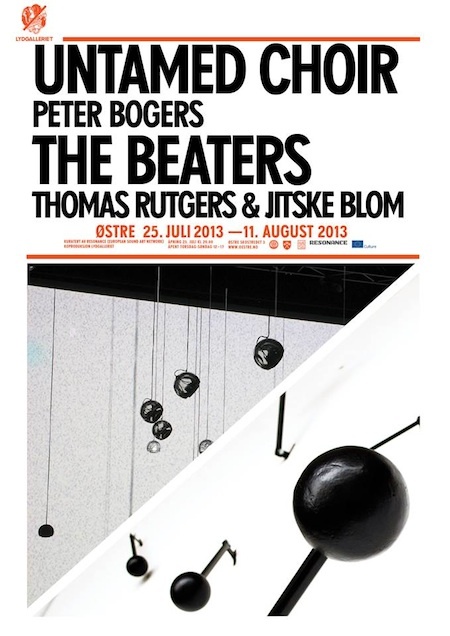 Peter Bogers – Untamed Choir | Thomas Rutgers & Jitske Blom – The Beaters. Two RESONANCE sound art installations presented by Lydgalleriet at Østre, Skostredet 3, Bergen (Norway). From July 25th until August 11th, 2013. The following YouTube clip gives you a 4’50” preview / walk-through in stereo, of Peter Bogers’s Untamed Choir. 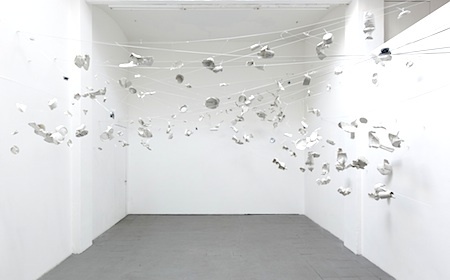 From June 6th until July 7th 2013, singuhr – hoergalerie presents Bursting Confidence, a sound installation created by the German artist Stefan Roigk for the RESONANCE network, at Kunsthaus Meinblau in Berlin, Germany. Stefan Roigk – Bursting Confidence. 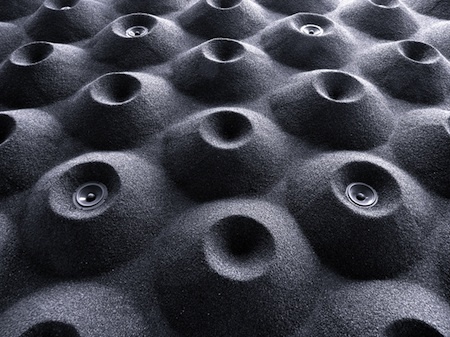 Sound installation at Kunsthaus MEINBLAU, Pfefferberg, Haus 5, Christinenstraße 18/19, Berlin. From June 6th until July 7th, 2013. Opening hours: Wednesday to Sunday 2 – 8 p.m., long night: July 7th, until midnight. Free admission. 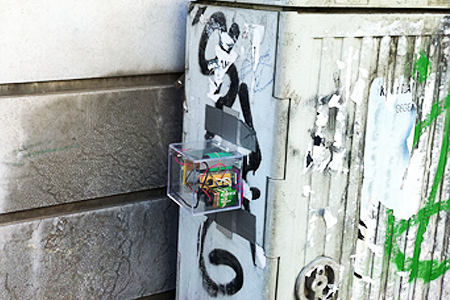 Over the past couple of years, the Dutch duo made up of designer Jitske Blom and sound artist & composer Thomas Rutgers has been creating quite some public hubbub (Openbaar Kabaal), by their occasional invasion of public spaces with a small army of remotely controlled ‘ticking devices’. Little percussionists, like tiny electric woodpeckers, that Jitske and Thomas stick, in the abstracted form of transparent wireless boxes, to lampposts, litter bins, traffic signs, benches, doors, shop windows, and to whatever else that through its materiality will provide an interesting sounding response to the ticking stimuli of the mechanical mini guerrilla musicians. 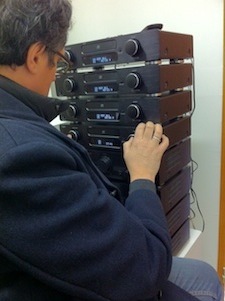 And then they have the little buggers play… To the often not little surprise and astonishment of unsuspecting passersby. Openbaar Kabaal / Public hubbub was the starting point, the genesis, for The Beaters, a work devised by Jitske and Rutger for the Resonance Network, which will premiere at the ECI Cultuurfabriek in Roermond (the Netherlands), between March 15th and April 15th 2013. What is the precise relation between your variable public interventions with the ticking boxes, and The Beaters? 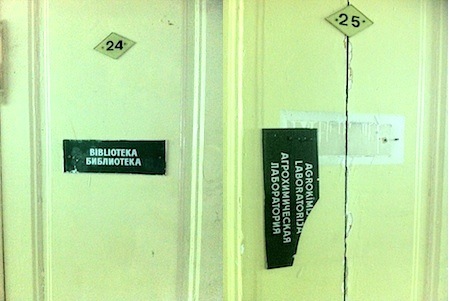 Is the new work a more formal version, a dynamic public intervention captured in a more static installation? And the ticking, the beating, will be all the time agains the same object? “Yes, for The Beaters we actually built sort of a gigantic wooden sound board. It is almost like a fake wall,” Thomas said. Did you pick a special kind of wood? So The Beaters are the black things that we see on the wooden panes in this picture of the work under construction? They really look like ‘stylized’ woodpeckers, don’t they? They also remind me a bit of little pumpjacks (jaknikkers). Or maybe even more like the different kinds of sticks, of different sizes and materials, that are used by a percussionist…? Did you compile this collection of sizes and materials in some sort of a systematic way? But all the beaters are powered in the same way? So that the composition will actually also be sort of a choreography? 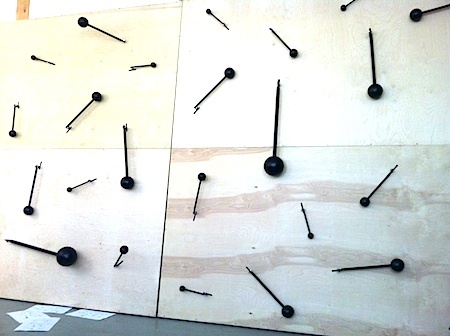 “In a way The Beaters are not unlike kinetic art,” added Jitske. But each of them has its fixed spot on the wood. They do not move along the panes, from one spot to another, do they? Are there more duplicates? Or are most of the beaters different? How many beaters do you have beating? And why? 31 is the 5th power of 2 minus 1. So it is more than just ‘odd’. It is also a prime number. Actually it’s the 3rd Mersenne prime. OK, I guess that’s a good enough reason to pick 31… Joking apart, what I have been wondering about in the context of specifically the Resonance project, is why you decided to construct something fixed, something that is like an instrument, instead of taking the opportunity to ‘invade’ spaces like you have been doing before, and use the beaters to investigate the different locations that the work will be presented in, make use of the different materials and their different acoustic properties, etcetera. You are still working on the details of the composition. Which will indeed be a composition, I mean, a piece that has a well defined starting point, a fixed development, and a well defined end. Isn’t it also typically a work, a situation, in which you would expect some sort of an interactivity? 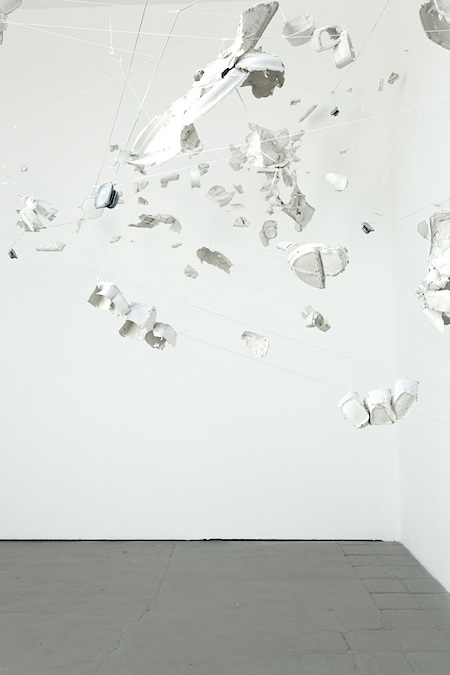 Between the actions of the beaters, and those of the visitors of the installation? With the density of beatings depending on the number of onlookers? Or vice versa? Even though it was maybe not intentionally conceived as such, The Beaters is – besides many other things – also clearly an instrument, a percussion instrument. And Thomas now is writing the first score (in Q-Base) for this instrument. Could he imagine inviting other composers to write pieces for The Beaters? Jitske Blom and Thomas Rutger’s The Beaters can be experienced in the ECI Cultuurfabriek, ECI 13, Roermond, the Netherlands. 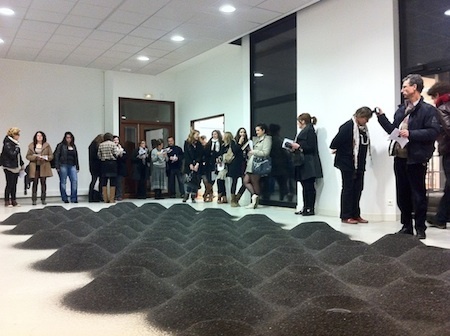 The opening will take place on Friday March 15th, 2013, from 17h00. 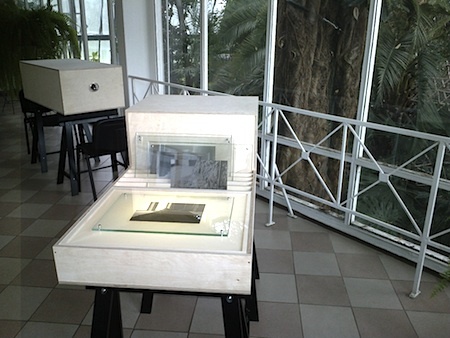 The work will be on show in Roermond until April 15th, 2013. … “The Beaters” has been produced for RESONANCE by Stichting Intro in situ in Maastricht, the Netherlands, with additional support from the Dutch Province of Limburg. 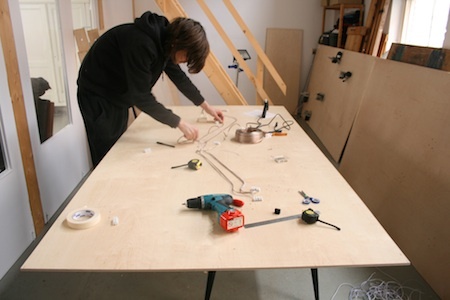 For the first in a new series of expositions presenting sound art works commissioned by RESONANCE, French artist Pascal Broccolichi created a next version of his Table d’Harmonie. 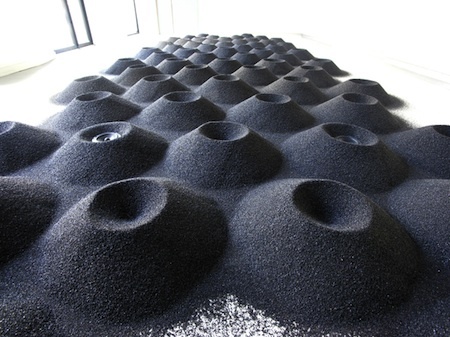 It can be experienced as a mono-solo-exhibition entitled Invasive Harmonie, produced by RESONANCE co-organizer Le Bon Accueil at the Galerie EC’ARTS of the Institut Universitaire de Formation des Maîtres in Rennes, France, until March 22nd. A couple of hours before Invasive Harmonie‘s opening on Thursday February 7th, Pascal gave detailed insight in the background and motivations for this impressive piece, which is a new phase and step in one of a number of continuing, evolving (research) processes that are an integral part of his method and approach in the making of art. 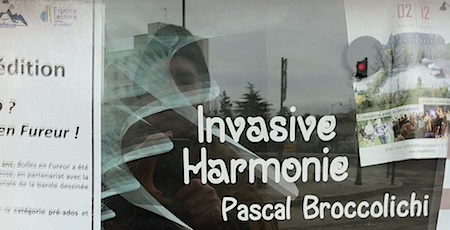 You can visit and experience Pascal Broccolichi’s Invasive Harmonie at the Galerie EC’ARTS de l’IUFM de Bretagne, 153 rue Saint-Malo, Rennes (France), weekdays between 12h and 18h, until March 22nd. Pascal Broccolichi’s website is at pascalbroccolichi.com. In the beautiful, peaceful garden of the Broelmuseum in the Belgium city of Kortrijk, 4 loudspeakers projected the soundscape that renowned British wild life sound recordist Chris Watson composed for this year’s edition of Kortrijk’s Sounding City. 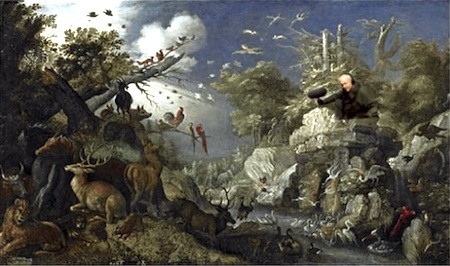 Watson’s piece/installation was inspired by one of the paintings in the museum’s collection: After the Deluge (Na de Zondvloed), an oil-on-panel, relatively small (the painting measures 53 by 91 centimeters), by Kortrijk’s Golden Age master Roelandt Savery (1576-1639). In view of the image’s scenery, I readily imagined a little Chris Watson wearing top-notch headphones, holding a pricey microphone and carrying state-of-the-art digital sound recording equipment, hidden somewhere behind one of the rocks or trees in Savery’s delicous & fantastic ‘wildscape’. It is a scene that looks ‘unnaturally natural’, not unlike the way in which Watson’s filmic collages of bigger-than-nature recordings sound ‘unnaturally natural’. Linking them, then, is obvious. But it is too much so. Paintings like Savery’s are full of implicit, unhear-able, sound (as David Toop pointed out in a lecture, also in Kortrijk, after having visited last year’s Savery exhibition in the Broelmuseum). But that what is unheard I prefer to imagine, in a non-sequential, in a time-less, way. The imposed explicitation in a sequential soundscape, that re-starts every 30 minutes or so, actually annoys me. On Saturday April 28th, in the Broelmuseum’s garden, during the opening of Sounding City, the sound of Watson’s exotic 4-channel ‘Savery’ nature-scape faded in the presence of the far more modest natural soundscape given by the mere fact of being out in the open, in public space, in the small city of Kortrijk. It was a subtle but forceful pointer to the simple beauty of what this work might have been, without loudspeakers and without exotic wild life sounds: just (a copy of) Savery’s painting installed in the middle of the garden’s lawn together with a small bench to sit on and listen. Nothing more. 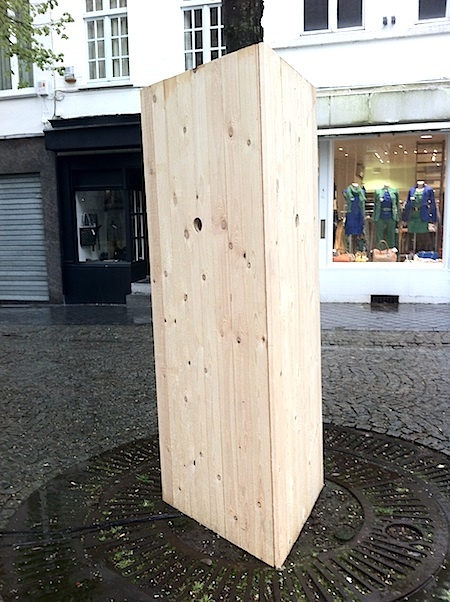 Chris Watson’s installation is one of the 11 sound/art works that, as part of the Festival of Flanders in Kortrijk’s Sounding City (Klinkende Stad), can be found at 11 different spots in the old Belgian town. All of them out in the open. Each one of them in ‘public space’. That’s pretty exciting. Though some of the works mainly keep their sounds ‘in a box’, the majority, like Watson’s Savery piece, are sounding out in the open. And whether they were meant to or not: the ‘art(ificial)’ sounds merge with the continuous flux of the ‘real’ small-town-sounds. As for Chris Watson’s installation, these proved to be stiff competition indeed. I was surprised at just how much the sound of each one of the Sounding City pieces made me more aware of the many other, contingent, sounds, that sur/s/ounded them. 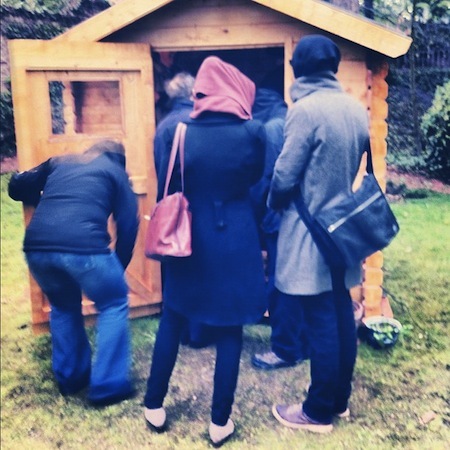 The best among the ‘outside a box’ pieces at Sounding City, each on their own terms and in their own manner, managed to include & subtly transform the Kortrijk soundscape that they were being inserted in. Like David Helbich’s Kortrijk + Jerusalem piece, like Patricia Portela and Christophe De Boekck’s Hortus or Dawn Scarfe’s Tree Music. 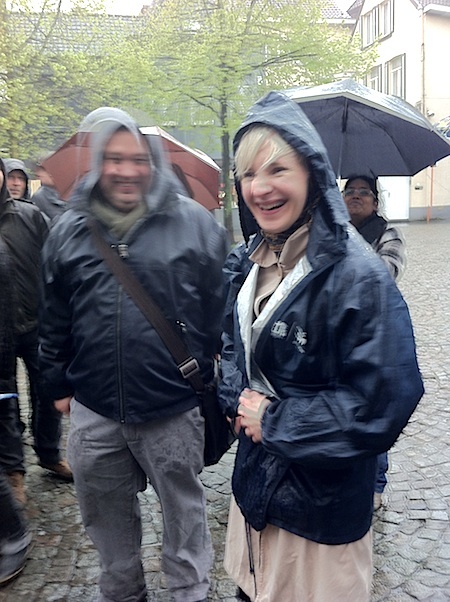 And like Evelina Deicmane‘s Becoming a Tree, one of the two Resonance contributions to Sounding City, a sequel to her earlier Resonance piece, A Long Day (that premiered in Kunsthaus Meinblau in Berlin in August 2011, and then went to Riga and Maastricht). Also for Becoming a Tree Evelina found inspiration in an ancient Latvian tale, that she visually abstracted as three simple, clean, wooden constructions, surrounding three trees on the Vandaele plein, in which from a number of tiny loudspeakers various wood-y sounds, based upon documentary recordings of her father’s working in the woods, un-loudly sprang back and forth between the buildings surrounding the square. 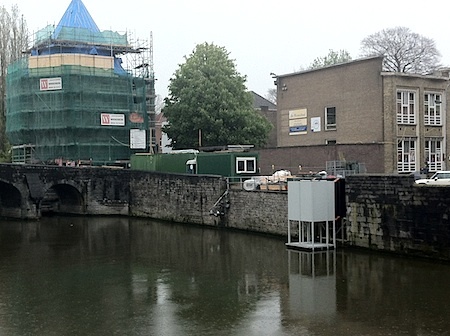 A second Resonance contribution to Sounding City was Stefan Rummel‘s Articulated Chambers, who installed his intricate and solid construction on and off the river traversing Kortrijk, the Leie. Stefan’s work could be found on the other side of the river right opposite the Broelmuseum, where a nice stone stair case invited passers-by to step inside. 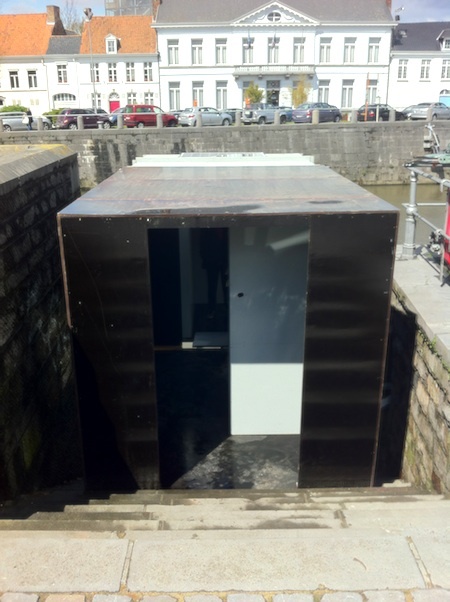 Even though the Articulated Chambers are, obviously, boxes, and the visitor, in a way, has to step out of the city to hear the soundscape that Stephan composed for it, once inside, through the open-ness of its construction, the city’s sound naturally mingles with the played back city sounds. 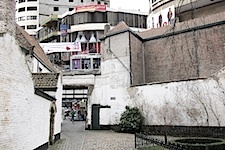 It thus was far less of a retreat than the little wooden garden shed that one discovered when entering, through what looked like a ‘secret corridor’, a most wonderful ancient garden in de Kleine Leiestraat. 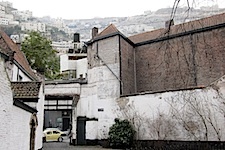 The cabin was part of and home to Gardening with John (2005), a piece by Alvin Curran, an American composer who has been living and working in Rome since 1965. It were the touches of sudden ‘strangeness’, of slight – sonic, but also visual – alienation, that made strolling through Sounding Kortrijk such an interesting and agreeable experience: suddenly stumbling upon Evelina Deicmane’s brand new wooden packing of the three small trees; Alvin Curran’s garden shed, looking a bit silly and misplaced in the old stately garden; Stefan Rummel’s Articulated Chambers, that also in Kortrijk gave the impression of having been installed at the side of the river for some, practical, industrial reason or other; but it’s just impossible to make up one’s mind as to what precisely that ‘industrial’ reason would be. Leif Brush is a, by now 80 years old, sound art pioneer, living in Duluth, Minnesota, where he transformed his spacious garden into an artist’s studio. The long brass ribbon is one of his terrain instruments: the Wind Ribbon. The long brass ribbon is supplied with contact microphones. To hear the sounds captured, we had to step inside the space on the ground floor of the Budascoop building, where Guy de Bièvre and Sofia von Bustorff (who went to Duluth, to meet up with the artist) furnished a room dedicated to Brush’s work, including (an inside version of) another of his terrain instruments: the Insect Recording Studio. 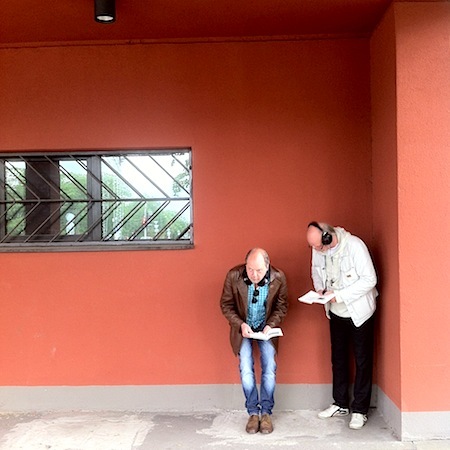 For the duration of Sounding City, the sounds of Leif Brush’s Wind Ribbon in Kortrijk are streamed live on the web, where you can listen to them continuously. And though Alvin Curran’s Cage piece is a good runner-up, you will probably find, like I did, that few or none of the sound-parts (mostly loop-ing) of the other pieces at Sounding City are able to match the endless variety, sonic wealth and at times – yes – sheer musicality of the Wind Ribbon. The following vimeo clip gives an overview of the opening of the Sounding City: Public Sound sound art exhibition at this year’s Festival of Flanders in Kortrijk, Belgium, followed by an impression of the evening concert, with sound projections by Jana Winderen and Mike Harding, who stood in for Chris Watson. 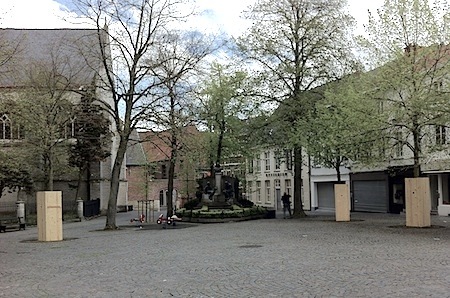 It all sadly will no longer be part of Kortrijk’s Public Sounding space again too soon. The complete set of installations can be viewed and heard in its entirety only two more days, over the coming weekend, on the afternoons of Saturday May 12th and Sunday May 13th. 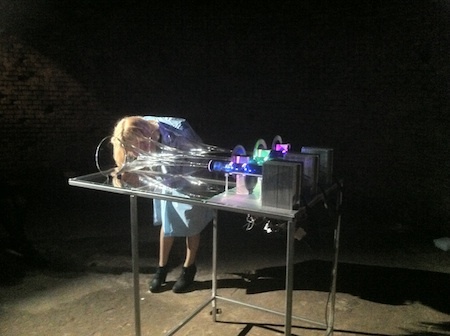 You are currently browsing entries tagged with installation at Resonance - European sound art network.